Coming of age in 1960s Paris, Bernard Applebaum exists in the hazy shadow of the Holocaust and on the electric cusp of the French New Wave. 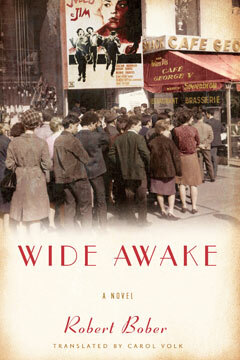 We find the narrator of Wide Awake as he wanders the city streets in search of signs of his father, who was deported by the Nazis in 1942. Bernard’s chance encounter with a former acquaintance who has become filmmaker Francois Truffaut’s assistant leads to a spot as an extra on the set of Jules and Jim—setting into motion a series of discoveries and lost memories that crack open a hidden past. On seeing Jules and Jim, Bernard’s mother is moved to divulge the secrets of her own past as a Jewish Polish immigrant to France, which curiously mirrors that of the film’s heroine. When revelations about his mother’s two loves lead Bernard on a fateful journey through Paris, to Germany, and back to Poland and Auschwitz itself, he must plumb haunting depths in order to recover his own identity. A beautiful and mysterious fictional memoir with echoes of W.G. Sebald’s Austerlitz, this riveting new work by one of France’s celebrated directors and writers will be a major new contribution to the literature of memory, loss, and how we grapple with the legacy of the Holocaust.